Donald Trump's chief economic adviser drafted a resignation letter and seriously considered submitting it in response to the president's comments after the violence in Charlottesville, Va. earlier this month, according to a new report. Gary Cohn, who is Jewish, considered resigning because of how the White House handled the events in Charlottesville, where white nationalist groups and neo-Nazis held protests that turned violent, the New York Times reported Friday, citing "two people familiar with the draft." Cohn told the Financial Times in an interview published Friday that the Trump administration "can and must do better" when it comes to condemning hate groups. "Citizens standing up for equality and freedom can never be equated with white supremacists, neo-Nazis, and the KKK," Cohn said. "I believe this administration can and must do better in consistently and unequivocally condemning these groups and do everything we can to heal the deep divisions that exist in our communities." 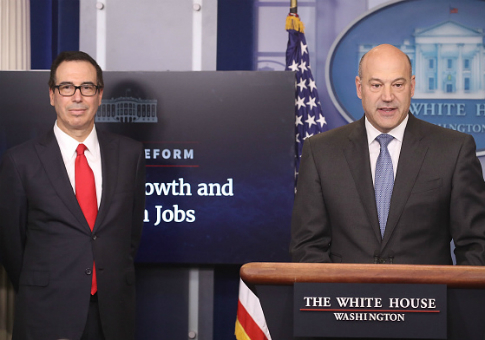 When the Financial Times asked Cohn if he considered resigning after Charlottesville, the former Goldman Sachs executed said, "I have come under enormous pressure both to resign and to remain in my current position." "As a patriotic American," Cohen added, "I am reluctant to leave my post as director of the National Economic Council because I feel a duty to fulfill my commitment to work on behalf of the American people. But I also feel compelled to voice my distress over the events of the last two weeks." Several members of Cohn's family, including his wife, and friends in the business world told him to consider leaving the administration after Charlottesville and the White House's response to it. "As a Jewish American, I will not allow neo-Nazis ranting ‘Jews will not replace us' to cause this Jew to leave his job," Cohn said. This entry was posted in Politics and tagged Resignation, Trump Administration. Bookmark the permalink.